With the hurdles facing many of the countries in the Euro zone, strategist have been tossing around the idea that the U.S. economy may in fact be decoupling from the rest of the economies around the globe. This is certainly an intriguing thought and would be supportive of better equity returns in the U.S. Better equity return doesn't necessarily mean positive returns though. One recently cited data point is the strength of the U.S. PMI (Purchasing Managers Index) relative to other country PMIs. The PMI measures the health of the manufacturing sector of the economy. Readings greater than 50 indicate the manufacturing sector is expanding while readings under 50 indicate a contracting manufacturing sector. As displayed in the below chart, the U.S. has been a standout versus a number of the other countries and regions. The above chart is showing data through May and the recently reported June U.S. PMI came in at 49.7. This was the first below 50 reading for the U.S. PMI since July 2009. With the June report, it appears decoupling may in fact not be occurring since the manufacturing segments of many economies are now contracting. It is not surprising the U.S. PMI is now below 50 given the interconnectedness of the world economies and the large percentage of revenue generated outside the U.S. by U.S. companies. From an equity market return perspective, the equity returns in the U.S. still appear to be positively correlated with equity returns outside the U.S., as well, specifically, Europe and the emerging markets. In the two charts below there remains a positive correlation between the S&P 500 Index and both the STOXX 600 Index (Europe) and the MSCI Emerging Markets Index. Positive correlation numbers indicate the two indices move in the same direction. For the emerging market index and the S&P, the recent correlation coefficent equals .62. This means 38% (.62 squared) of the variation in return is related. In the end, I do not believe we will see a complete decoupling of the U.S. markets and economy with the other markets and economies around the world. 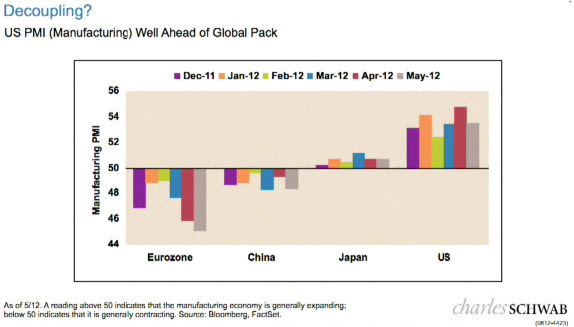 I do believe the U.S. is in slightly better shape than many of the Euro zone economies as well as some emerging markets. 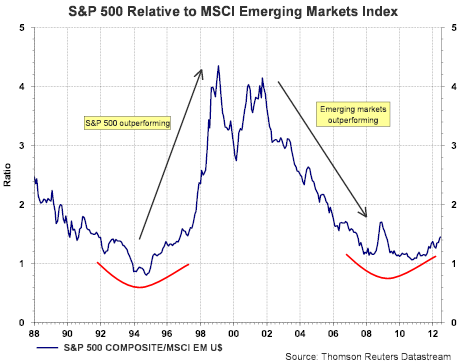 Therefore, on a relative basis, the U.S. could continue to outperform a number of its foreign counterparts, with one example being the recent performance of the S&P 500 Index relative to the performance of the emerging markets index detailed below. After the emerging markets outperformance from 2000 through 2010, maybe the S&P is poised for stronger relative returns in the coming decade for a whole host of reasons. Market returns do not move higher in a straight line and market volatility is likely a continuing theme. Additionally, there are near term potential headwinds: an upcoming debt ceiling debate, the fiscal cliff, the U.S elections in November, just to name a few. For a more detailed review of factors to consider, Charles Schwab's Chief Investment Strategist, Liz Ann Sonders' recently released the July Market Snapshot video and it is a worthwhile video to view. Obama's Tax Platform Putting Retirees At Risk?